How could I achieve a fullscreen window? It is not resisable and it doesnt use OpenGL (I heard it was hard to fullscreen an OpenGL thingy ). You're following really old instructions. Anything about Raspberry Pi more than a couple of years old will be misleading. In the Configuration / Screen option, you can set full-screen. Cool! Only thing is, it runs really bad. Im getting 0.5fps just when im trying to boot spyro the dragon ***IN WINDOWED MODE ***. Tried with Crash 1 & 3 and I get similar results. Any tips? The tutorial I followed is giving me a nice 60fps! One of the pcsx_rearmed source links here: https://retropie.org.uk/docs/Playstation-1/ ? Last edited by scruss on Wed Oct 17, 2018 1:00 am, edited 1 time in total. How am I supposed to run this on full Raspbian? I know it had something to do with the "build from source" thing (probably) but again im gessing. Any tips? And thanks for the quick reply. Is there a way to make it work for pcsx_rearmed? no, that's a source modification in the Minecraft code, so it won't work for the PS1 emulator. Isnt that the proof that we can make it fullscreen? Is there a way to make the preview fullscreen..? EDIT: If you type ALT+F11, the window gets undecorated and changes positions to top left up. It made Minecraft Pi fullscreen tho! That's proof that SimpleScreenRecorder knows how to capture window content. Not much else, sorry. TIL that the commercial PlayStation Classic uses PCSX-ReARMed. Oh my god. Been searching all over the internet for an answer and here it is. Works fantastic on my Pi3B. Thank you. Imma do an update video on this! Might be a nice touch to see a game playing at the end. Im now trying to make a shortcut to open Spyro the dragon from my start menu. 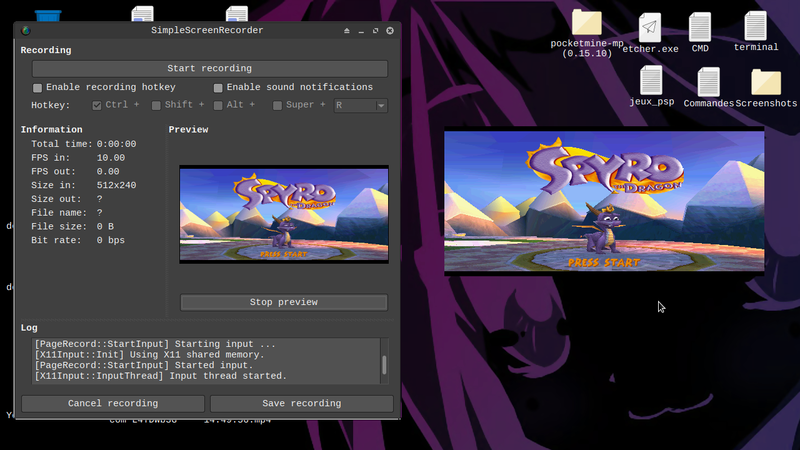 ./pcsx --load "/home/pi/EMU/Spyro the Dragon.bin"
With no luck. Any tips? The error message in the logs told me it was missing some kind of -cdfile parameter. It also said I could load PSX EXEs? and the game would only partially run. Then ./pcsx -cdfile '/home/pi/Gran Turismo 2 (Simulation Mode) (v1.2).bin' worked and I did not see the previous messages. I just got my PS3 controller from a friend of mine. Managed to connect it after many attemps via bluetooth! The emulator works great. No input latency whatsoever. I also managed to install Quake 3 alongside, but it seems to require some key mapping to work with the controller. Is there a piece of software out there that can translates my button inputs from the ps3 controller to keyboard keystrokes? I then tried to install the required package using apt-get but it told me that it was "unable to locate package libxtst"
i then got to trolltech s website but it seems to be broken- gave a quick google at trolltech s qt and accessed the "qt.io" website. Seems ill need to build from source their piece of software. Maybe im wrong, can we install it using apt-get? Im going to build this thing later on in the day. Last edited by WillBoxOwO on Sun Nov 25, 2018 5:05 pm, edited 1 time in total. Curious as to how you guys find the performance when those lines are commented out and the beta driver is enabled. Instead of giving an error it works in windowed mode but won't go full screen. I'm assuming you're talking about PCSX ReARMed - pressing f11 should toggle full screen.